Nike's "Dream Crazier" ad celebrates female athletes like tennis star Serena Williams, gymnast Simone Biles and others who have challenged the norm. These are all used to describe women showing emotion at work, and they're also words addressed in last night's Nike ad, starring tennis giant Serena Williams. 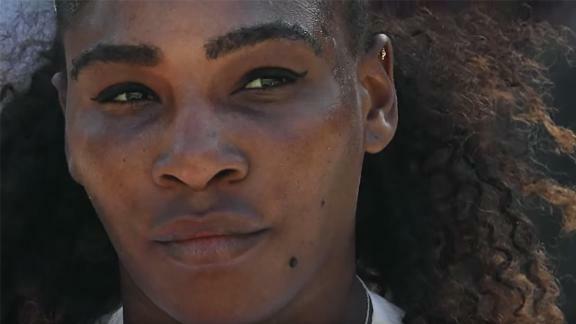 The ad, aired during the 2019 Academy Awards ceremony, took on the divide between how men and women are perceived in moments of intense emotion — a divide Williams knows all too well after her news-making dispute with an umpire at September's US Open. Following an argument with umpire Carlos Ramos, in which she called Ramos a "thief," the US Open fined Williams $17,000. But Williams noted that she's seen male tennis players call umpires "several things." The controversial ruling sparked an international debate about the double standard for men and women who show emotion. Even tennis legend Billie Jean King weighed in, praising Williams for her comments and tweeting that "more voices are needed to do the same." This difference in perception often hurts women's advancement in the workplace. Women may be penalized for acting overly "emotional," "hysterical" or "aggressive" in some situations, but men in the same will instead be praised as "passionate." Women of color face even more hurdles. As a woman of color working in academia, Jennifer Gómez, post-doctoral fellow in psychology at Wayne State University, says she's seen this same dynamic Williams illuminates in the Nike ad. "For me, I've spent a lot of time over the years thinking about how I can change how I talk," she says. "I've been accused of being attacking, intimidating, disrespectful, all these things — and at one point I said, 'I'm not being those things so I'm not going to change.'" "I myself have watched myself appraise a woman in a meeting, thinking 'oh, she's being so this, she's being so that,' and then I have to think, 'Oh, if it were a white man who was doing this, would I think the same thing?' and sometimes the answer is 'no,'" she says. "So understand and be humble that we have all been socialized in these ways."